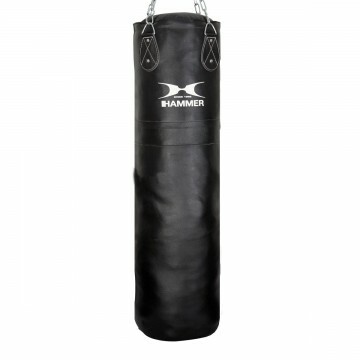 Durable punching bag made out of robust leather. 4 chrome-plated steel chains and stable steel mounting. Swivel for realistic evasive manoeuvres that keeps mounting from twisting. Double stitching for more durability. 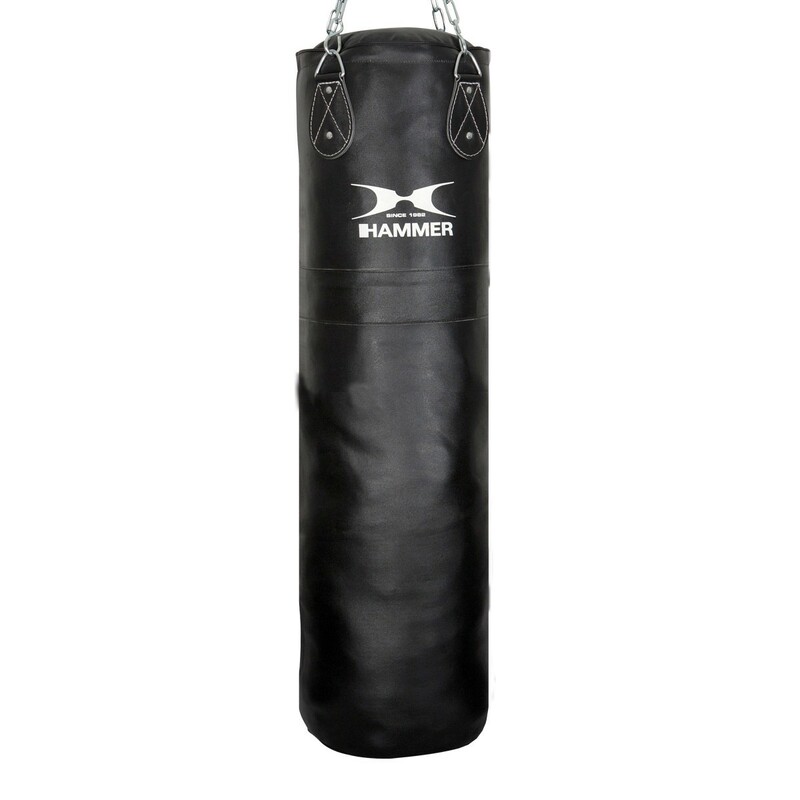 The Premium leather punching bag are solid, durable and always ready to use. High-end boxing equipment for professional punching bag workouts and preparation for competitions. Quality leather and select cushion material for hard, professional training sequences. Uncompromising equipment for professional use at home. 4 chrome-plated steel chains and swivel ensure a centered and stable mounting of the bag, which significantly reduces the risk of injury when you work out. The mounting does not twist and the material is conserved. The HAMMER punching bag PREMIUM gives you everything you need for realistic "opponent workouts" in the comfort of your own home. The punching bag is made out of durable and robust leather in a sporty, masculine black. The punching bag's length and the quality of its outer surface is very ideal for kick techniques! 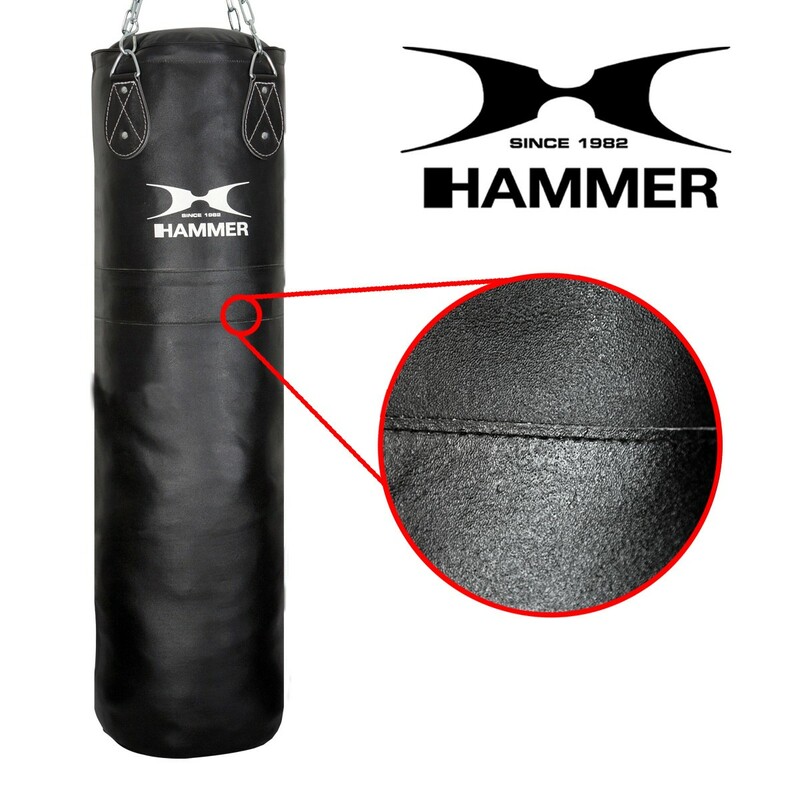 HAMMER punching bag PREMIUM, the perfect power punching bag for intense demands. Great punching bag for a fair price. Very good workmanship. Ideal also for kicks and harder punches. The shop assistant explained the advantages and disadvantages (greasing the leather) of a leather punching bag to me in great detail, so that I opted for this 120 cm bag. The quality is great and the price is totally acceptable. Even the filling is perfect - neither too hard, nor too soft.